Tag line: "The epic story of a world at war. 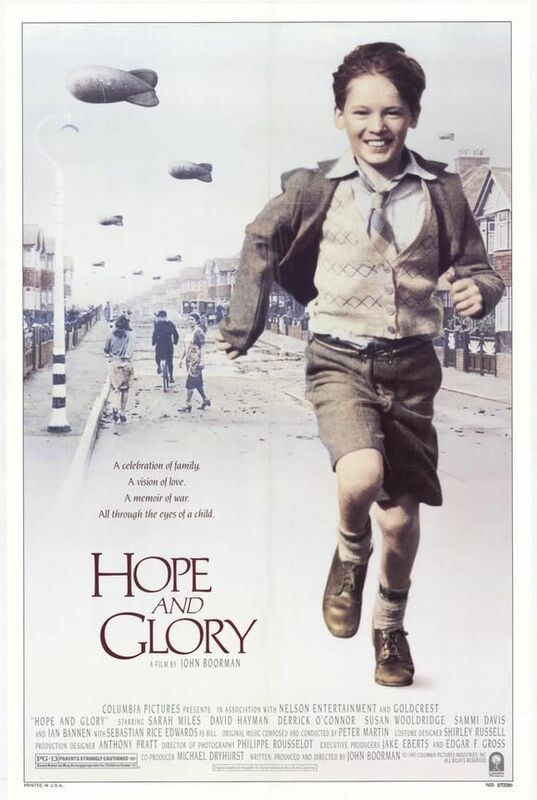 And a boy at play"
John Boorman’s Hope and Glory, a 1987 film about a small family coping with the difficulties of living in London during World War II, played regularly on cable TV in the late ‘80s. I never sat down and watched it from start to finish back then, but there’s one moment from its trailer that always made me chuckle. It’s one of several funny moments to be found in Hope and Glory, a film that is also, at times, quite sad, and even a little romantic. A semi-autobiographical account of director John Boorman’s own childhood, Hope and Glory opens in 1939, just as England has declared war on Nazi Germany. Young Billy Rohan (Sebastian Rice-Edwards) lives with his family in the suburbs of London. In a fit of patriotism, Billy’s father, Clive (David Hayman), enlists in the army, and his mother, Grace (Sarah Miles), fearing what might happen, makes plans to send Billy and his younger sister Sue (Geraldine Muir) to live with relatives in Australia, where they’ll be safe from Nazi air raids. But Billy refuses to go; he’s excited by the prospect of a war being fought in his own backyard, and over the next few years he experiences quite a bit of what 20th century warfare has to offer. German bombs destroy several neighborhood houses, and planes battle in the skies above. In addition, Billy’s teenage sister, Dawn (Sammi Davis), falls in love with a Canadian soldier (Jean-Marc Barr) who is stationed nearby. But as Billy will eventually discover, war isn’t all fun and games. In fact, there are times when it can be downright heartbreaking. The magic of Hope and Glory lies in how it views war through the eyes of a child, who thinks it’s kinda neat when his classes are interrupted by air raid sirens, or he finds a few shards of shrapnel lying in the road. At one point, Billy joins a gang of kids that invades bombed-out houses, breaking anything that’s still standing. Billy isn’t alone in his fascination with World War II; one afternoon, a German plane is shot down, and the entire neighborhood gathers to gawk at the pilot (played by Boorman’s son, Charley), who parachuted into a nearby field. Of course, war can also be tragic, and Hope and Glory doesn’t shy away from the chaos of late night air raid sirens or explosions that shatter glass and reduce dwellings to rubble. In conditions such as these, children are forced to face some harsh realities (one of Billy’s friends is orphaned when her mother is killed by a bomb), and even adults occasionally ponder the paths that their lives have taken. With Clive off fighting the war, Grace finds herself growing closer to Mac (Derrick O’Connor), Clive’s best friend (and the guy she once had a crush on). War undoubtedly leaves a lasting impression on the soldiers who serve on the front lines, but as Hope and Glory demonstrates, it can be just as tough on those they’ve left behind. Well-acted from top to bottom (Sebastian Rice-Edwards is especially fantastic in what is essentially the lead role), Hope and Glory is a funny, poignant, and often moving portrait of a family doing their best to deal with a difficult situation, and learning a bit about themselves in the process.